Set in the first burial grounds of the Swan River Colony, REST provides a unique, immersive opportunity to explore the East Perth Cemeteries after dark. 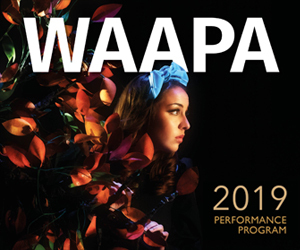 Created and directed by James Berlyn in collaboration with members of the WA Youth Theatre Company (ranging in age from 15 to 25), this sophisticated production reinterprets the early history of Perth in a vital and compelling way. As they move through the site, audience members are encouraged to “follow the lights”, which leads to encounters with black clad figures among the grave markers – sometimes in shifting tableaus, other times in intimate face-to-face engagements. In one striking “Choose Your Own Adventure” styled moment, audience members are invited to sit individually with the solo figures scattered throughout the grave sites. Choosing a seat leads to an intimate and personalised storytelling, as each cast member speaks about, or on behalf of, a person buried on the grounds. These impressive young performers conversationally tease out ideas from historical narratives, asking questions of their listeners and encouraging a sense of connection – between both living strangers and people from the past. The tales of the cemetery residents are handled with respect and grace, while being used as a starting point to provoke deeper contemplation of issues, including immigration, legacy, family and mortality. The result is a fascinating, emotive and sometimes confronting experience that is unique for every person in the cast and audience. REST challenges the singular narratives of history class, delivering diverse stories with a multiplicity of voices to question what is missing from official records – particularly the still-overlooked histories of Noongar Aboriginal peoples. The formerly neglected East Perth Cemeteries, where less than ten percent of the graves currently bear a marker, provide the perfect context for these considerations. Complete with the opportunity to stare at the stars, this well-crafted and profoundly moving show will leave you with a new-found interest in the history of our city. REST plays East Perth Cemeteries until February 10. Pictured top: Cast members of ‘REST’ at East Perth Cemeteries.